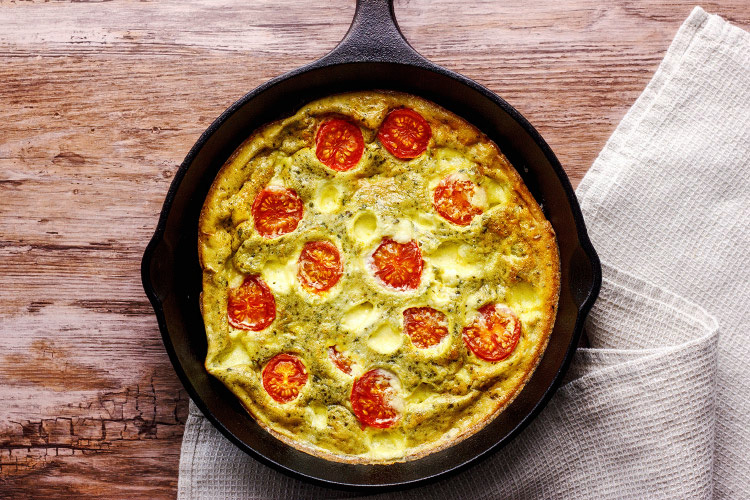 A fast, four-egg frittata made with the classic Caprese flavours: tomatoes, mozzarella and basil. A four-egg frittata is great for two people, a fast and easy lunch or light dinner that needs nothing more than a simple green salad alongside. Here the flavours are inspired by the components of a Caprese salad – tomatoes, mozzarella and basil – as well as bonus flavours from the pesto: garlic, pine nuts and Parmesan cheese. Use fresh pesto from the deli to make life easier or, if you’re feeling industrious, make your own. Mozzarella is bright white and comes packed in brine. If you see something that’s yellow and shrink-wrapped in plastic, keep moving. It might be cheese, but it’s not mozzarella. I most often buy mozzarella as tubs of walnut-sized bocconcini, or the tiny, grape-sized bambini bocconcini. If you let the frittata rest for a few minutes after taking it out of the oven it will set a little more firmly and release from the pan very easily. Because it sets so well, a frittata becomes perfectly portable when cold; I pack wedges of it for a picnic or for lunch on a road trip. Set your oven to 220°C (425°F). On the stovetop, in a non-stick frying pan with an ovenproof handle, heat just enough oil or butter to create a thin film over medium-high heat. Break the eggs into a mixing bowl and beat lightly with a fork to combine. Stir in the pesto, half the mozzarella and season with salt and pepper. Pour the mixture into the pan and immediately turn the heat down to low. Let it cook for a few minutes until it’s no longer completely runny. It does not have to set completely, like an omelette; only the base needs to be set at this stage. Sprinkle over the remaining pieces of mozzarella and pop on the tomatoes, cut side up, pushing them gently down into the frittata as you do so. Put the pan into the oven and let it cook for 10 minutes. It’s ready when it has puffed up a little, letting you know that the top has set. Let it rest for 5 minutes before sliding onto a board or plate and cutting into wedges to serve.